Last Thursday myself and my mum went along to the Ideal Home Christmas show at Earls Court, London. It was their first ever show so we thought we would give it a try, in the hope it would get us into the Christmas mood. Upon arrival at the show it certainly did just that. There were loads of white Christmas trees lining the path up to the entrance and a snow machine pumping out snow that we had to tramp through to get in the doors. I got so excited, I felt like a little kid again ha ha small things will please small minds I think the saying goes! As we walked through the main doors, the whole floor was covered in a white, glittery felt type material to look like snow, this was throughout the whole venue, it looked fab (although I do wonder what it looked like at the end of the last day, never mind) There were more trees and I was so pleased that it was looking to be better than expected. It looked like a Magical Christmas Wonderland. We had our first stop in sight of what we wanted to see first, so we headed straight to the Celebrity Chef Stage. 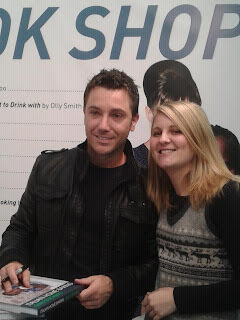 I even got to meet the man himself, I bought a copy of his book which he kindly signed and I got a couple of kisses too, you can imagine how excited I was right about then, so much so I was actually shaking (what an idiot, I felt a right fool) still I had just had a kiss off Gino D'Acampo I'm pretty sure I can be excused for that. I would be shaking myself. Perfect excuse to get in the Christmas spirit!